The Atlantic Yards Community Benefits Agreement Coalition has started a series of “Meet and Greets” in Brooklyn, NY to both introduce community residents to the proposed $3.5 billion, Frank Gehry-designed Atlantic Yards project and to elicit additional feedback.... Future Meet & Greets are planned to occur regularly in the ensuing months. While the issue of community benefits would presumably be interesting to a broad range of people, Forest City Ratner p.r. staff apparently want to get the word out to the black/urban audience. Our Meet and Greet(s) are intended to be an open forum in which community residents and businesses can gather and meet an assortment of CBA signatory groups and representatives. 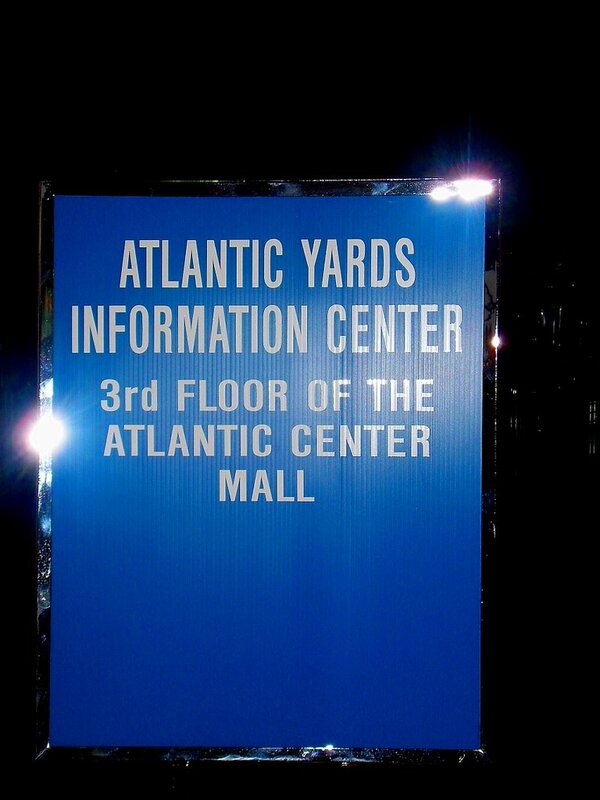 In addition, these series of Meet and Greet(s) are to inform community residents and businesses more about the community benefits of the Atlantic Yards Project (AYP). 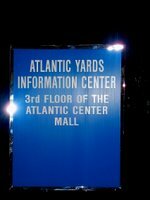 If you want to learn more about the CBA Atlantic Yards Project, have an idea, suggestion or just want to enjoy the company of your Neighbors, please join us! Our Meet and Greet(s) are free and you are welcomed to come via RSVP. 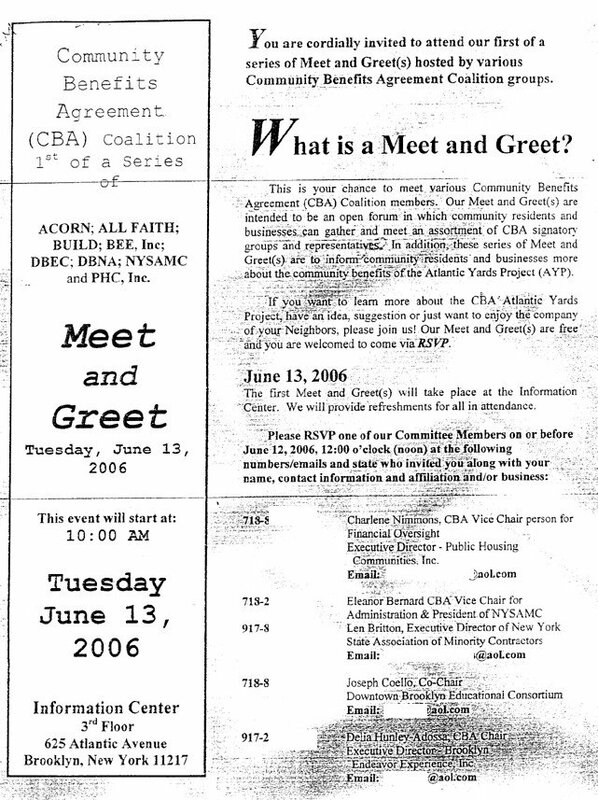 Given to attendees was a copy of the "Connect to CBA Opportunities" brochure produced by BUILD. 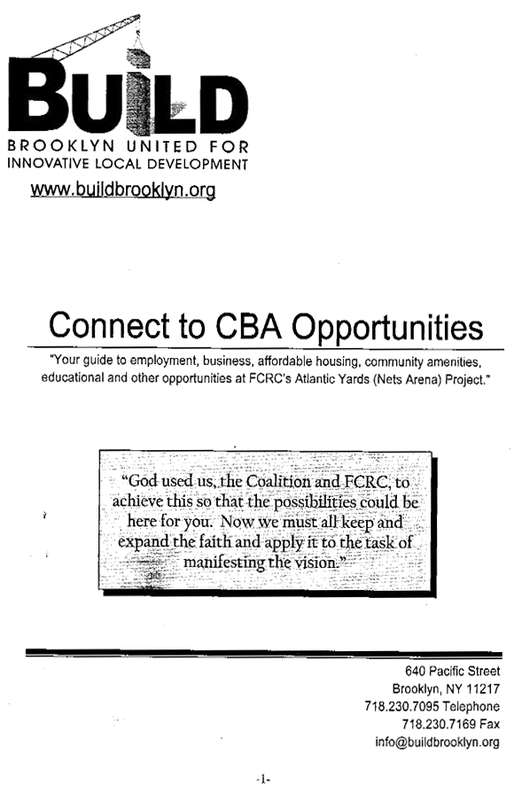 The same document, which discusses plans for job training, affordable housing, and other CBA components (some of them still emerging), was given out Tuesday at the BUILD meeting, also held at the Atlantic Yards Information Center. 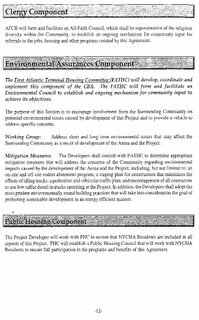 --13 people from nine different public housing projects across Brooklyn, representatives of Public Housing Communities, a CBA signatory. 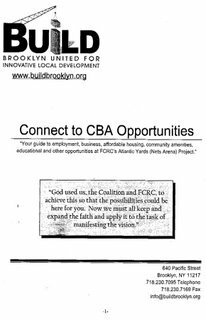 Not present at this meeting were representatives from three CBA signatories: the Downtown Brooklyn Educational Consortium (DBEC), headed by Freddie Hamilton; the Downtown Brooklyn Neighborhood Alliance (DBNA), headed by the Rev. Herbert Daughtry; and the All-Faith Council of Brooklyn (AFCB), co-chaired by the Rev. Walter J. Morris. Based on the "Connect to CBA Opportunities" document, it seems that at least a couple of the CBA signatory groups are still in formation. (Click on the page at right for a larger view.) 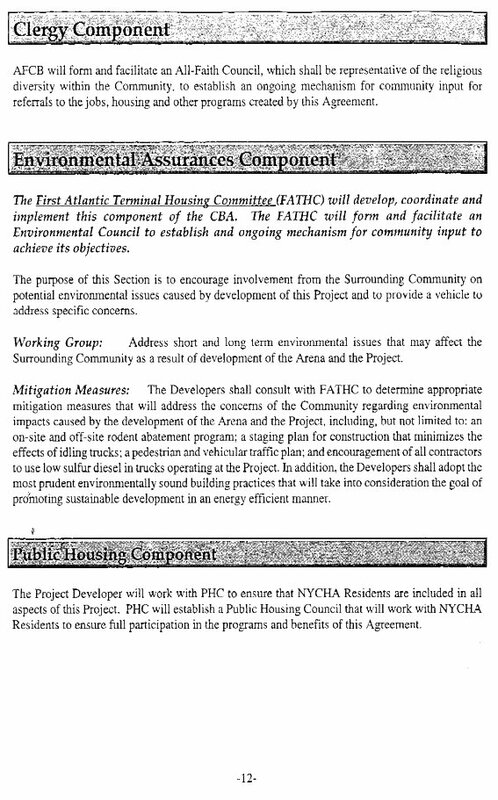 It states that PHC "will establish a Public Housing Council that will work with NYCHA Residents to ensure full participation in the programs and benefits of this Agreement." Also, it states that "AFCB will form and facilitate an All-Faith Council, which shall be representative of the religious diversity within the Community, to establish an ongoing mechanism for community input for referrals to the jobs, housing and other programs created by this Agreement." 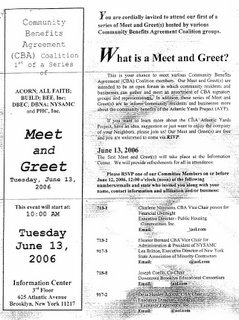 I wanted to find out more about this meeting and future meetings, so on Wednesday I called and emailed CBA Chair Delia Hunley-Adossa. I haven't heard back yet.